Excellent: 760+: You should generally be able to qualify for the best rates, depending on your debt and income levels and the amount of equity you have in your home. Good: 700-759: You should typically be able to qualify for credit, depending on your debt and income levels and collateral value (but you may not get the best rates). Fair: 621-699: You may have more difficulty obtaining credit, and will likely pay higher rates for it. Poor: 620 and below: You may have difficulty obtaining credit. No credit score: Typically, you have not built up enough of a credit file at the credit bureau to calculate your score, or your credit file has not had activity for some time. These ranges are for general guidance and may vary by financing type. Explore ways to build strong credit. Add the amount you want to borrow to the amount you already owe on your home, and make sure the total isn’t more than 85% of your home’s value. For example, if your home is worth $200,000 and your mortgage balance is $120,000, that means you have $80,000 in total equity. You may be able to borrow up to $50,000 of that equity before reaching 85% of your home’s value. 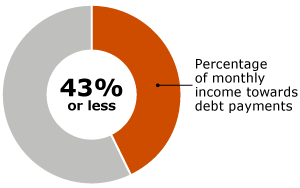 Calculate how much you pay each month on your current debts—such as mortgage, credit card, and student loan payments—and make sure the total isn’t more than 43% of your monthly pre-tax income. If you need help, here are some tips on reducing your debt.